So many cultures have the concept of taking a filling of some sort, stuffing it in a wrapper of sorts, and serving it to you all warm and tasty. 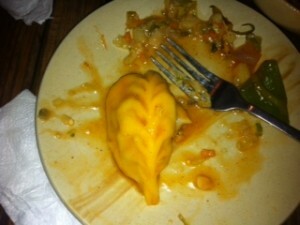 However the Nepalese take it to a whole new, and super tasty, level. Meet the Momo! The momo is slightly larger then its Chinese cousin, but its wrapper is thinner, being just thick enough to keep the contents inside and the chili sauce (if you choose to have them chilified) on the outside. While you can get them non-veg (read meat filled) the veg option tends to be better, with the veggies cooked but still crunchy. A proper momo is about the length of the palm of your hand (assuming you have dainty little hands like moi), and should be dipped in a light but spicy sauce that makes the whole thing even tastier. Momos are slowly becoming easier to find in the US but if you can swing it I highly recommend eating them in Kathmandu, paired with a very cold beer, and ideally overlooking the Boudhanath Stuppa!